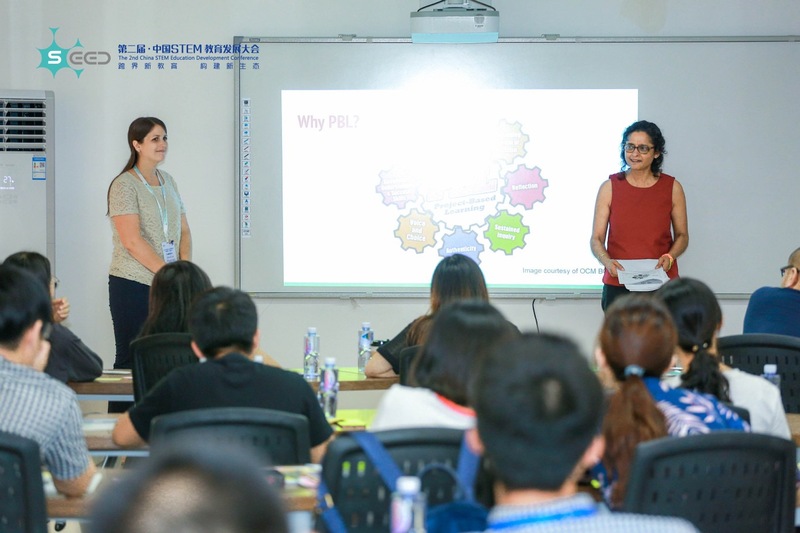 Obercon and Pandya-Vaughan present at the Second Annual Chinese STEM Education Development Conference in June. 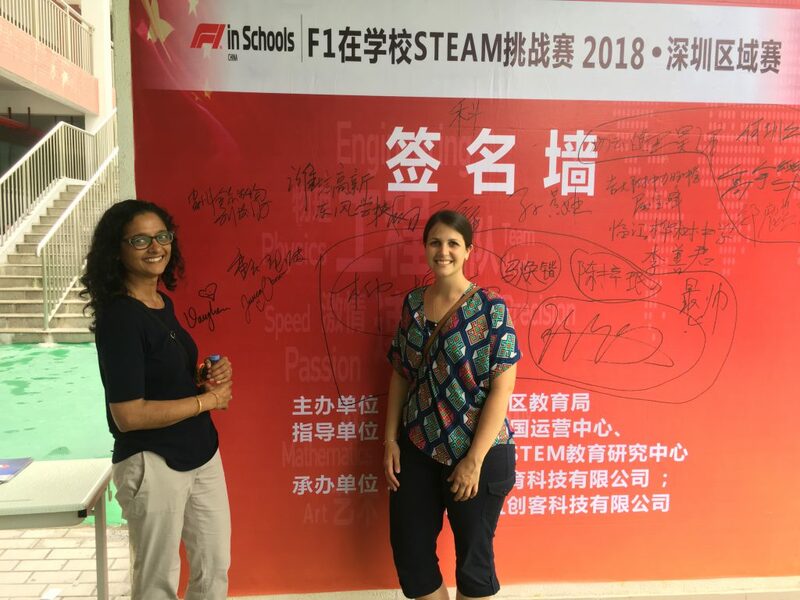 Tech Valley High School teachers Jessica Obercon and Varada Pandya-Vaughan traveled to Shenzhen, China to present at the Second Annual Chinese STEM Education Development Conference (CSEDC) from June 28-July 3. Obercon and Pandya-Vaughan were asked to present on practical STEM teaching in a workshop and STEM in United States schools in a speech. Naturally, a presentation on practical STEM teaching led them to project-based learning (PBL) – which is at the core of Tech Valley High School’s curriculum. They also gave a speech detailing how TVHS integrates STEM into its curriculum as a PBL school. The CSED Conference comes at a time when the Chinese government is pushing for more STEM instruction in the nation’s schools – a curriculum that is shared nationwide and often scheduled down to the week. Pandya-Vaughan says the education board in China is clear that STEM needs to be implemented, but that students aren’t prepared for this kind of instruction. Often in China, classes are large, consist of lectures and learning facts to take a test, an environment that is quite the opposite from the project-based learning that goes on at Tech Valley. Despite this lack of preparation, both say teachers in China have a strong drive to learn new tactics to ensure their students get the best education possible. Their presentation was structured like they would run a class – introducing the topic with a project then building the skills along the way to bring that project to fruition. Obercon and Pandya-Vaughan said they stressed to the conference attendees that as educators, they must prepare students to respond productively to the changing world, and that project-based learning is going to help achieve that goal. Pandya-Vaughan and Obercon at CSEDC in June. They also explained that not all projects look the same. Timeframes, individual/group structure and final products are different for each project, and not only is that ok, but that’s the point of project-based learning. Some schools in China are already implementing STEM instruction into their curriculum. Obercon and Pandya-Vaughan visited a middle school during the conference as students presented a science fair. There were a variety of STEM projects on display, including a toothbrush dryer designed to keep your toothbrush from developing bacteria, and a choreographed dance using robotic chairs via remote control. Like any new topic, it can be overwhelming – but the pair said it seemed their obvious excitement about what they do helped those attending see this change in a more positive light. “They were relieved to know that when it actually came to teaching, there are parts when you have to actually deliver instruction and it could look the same. I think that comes as a relief for teachers everywhere,” Pandya-Vaughan said. “I think it was a lot to take in, because this is new to them. Even to teachers here in America, when they hear what we’re doing they’re like woah, ‘how do you do that?’ but seeing that we obviously love what we do helped I think,” said Obercon. Tech Valley HS has a sister school in Tianjin, China, and partners with the Confucius Institute at UAlbany, which led to the opportunity for Obercon and Pandya-Vaughan to present at the conference. All students also take at least two years of Chinese. In another example of how TVHS continues to expand its worldwide reach, many at the conference also wanted to exchange contact information with the duo, hoping to connect after the conference and asking if they could come visit the school, joining a list of dozens of other worldwide educators who have visited Tech Valley High School. Such visits are common – a testament to the power of collaboration reaching across the globe.